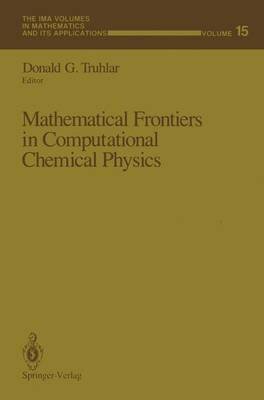 This IMA Volume in Mathematics and its Applications MATHEMATICAL FRONTIERS IN COMPUTATIONAL CHEMICAL PHYSICS is in part the proceedings of a workshop which was an integral part of the 1986-87 IMA program on SCIENTIFIC COMPUTATION. We are grateful to the Scientific Committee: Bjorn Engquist (Chairman), Roland Glowinski, Mitchell Luskin and Andrew Majda for planning and implementing an exciting and stimulating year-long program. We especially thank the Workshop Organizer, Donald Truhlar, for organizing a workshop which brought together many of the major figures in a variety of research fields connected with atomic and molecular structure for a fruitful exchange of ideas. Willard Miller, Jr. Hans Weinberger MATHEMATICAL FRONTIERS IN COMPUTATIONAL CHEMICAL PHYSICS PREFACE The Workshop on Atomic and Molecular Structure and Dynamics was held June 15-July 24, 1987 at the Institute for Mathematics and Its Applications on the University of Minnesota Twin Cities campus as part of the 1986-87 I. M. A. Pro gram on Scientific Computation. There were over 70 participants, including the eleven plenary lecturers whose contributions form the chapters of this volume. The chapters discuss a wide variety of topics in the subject area of the Workshop. Each chapter includes expository material that is especially prepared to introduce the subject to a mathematical audience interested in studying frontier areas in math ematical chemical physics, and in addition each chapter also discusses challenging problem areas where additional mathematical progress is necessary and desirable for the advancement of the field."